Toledo’s traditional cuisine can be defined as tasteful and evocative, expressive, bright, frank and direct, consistent and nutritious. A joyful assembly between simplicity (its products) and sublimation (the ingenuity of its people). Because its ingredients are rather humble, Toledo’s gastronomy requires high doses of wit and ability to make the best of each product and succeed in the harmony of tastes. These were the arguments that the town of Toledo used to promote its candidacy for next year’s Spanish Gastronomy Capital contest. The La Mancha city will hold the title from January 1st 2016, taking up the baton from Caceres. The culinary term coincides with the celebration of its 30th anniversary as UNESCO’s World Heritage site. Toledo’s heritage comes from the different languages, cultures and religions that have lived on the town’s streets leaving a deep imprint. It started as a Roman city, then it became the capital of the Visigoth kingdom. Later, it emerged as one of the most important Arab cities of al-Andalus, and after the Christian Reconquista, it hosted a court of Castilian, Leonese and Spanish kings until the sixteenth century. It also had one of the most active Jewish quarters in the world. This heritage permeates the traditional recipes that form its cuisine and that you will be able to taste after walking through its intricate old town. A good starting point is the street of Cardenal Tavera, where you will be able to find the Tavera Hospital, a large Renaissance complex flanking the entrance to the old town through two monumental gates: the New Hinged Gate and the Old Hinged Gate, the oldest Arab building in the city. After this first contact, you will be ready to try the carcamusas, the most typical tapa in Toledo. This spicy beef stew with tomatoes and peas is the perfect snack to combine with a good glass of red wine. 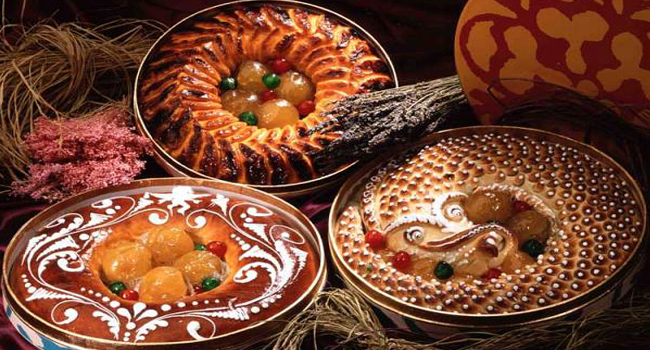 It is served in a traditional clay pot and accompanied by a bread slice. 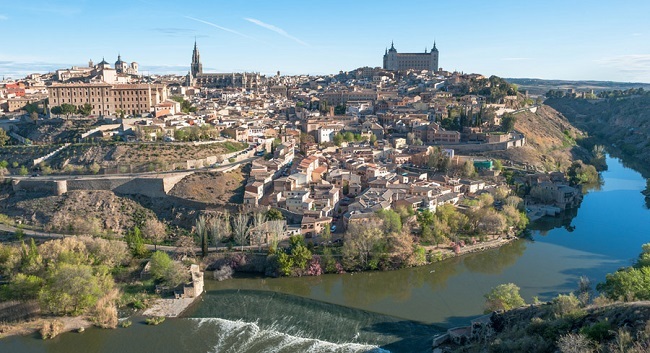 After all this sightseeing, you should stop to get to know Toledo’s gastronomy a bit better. 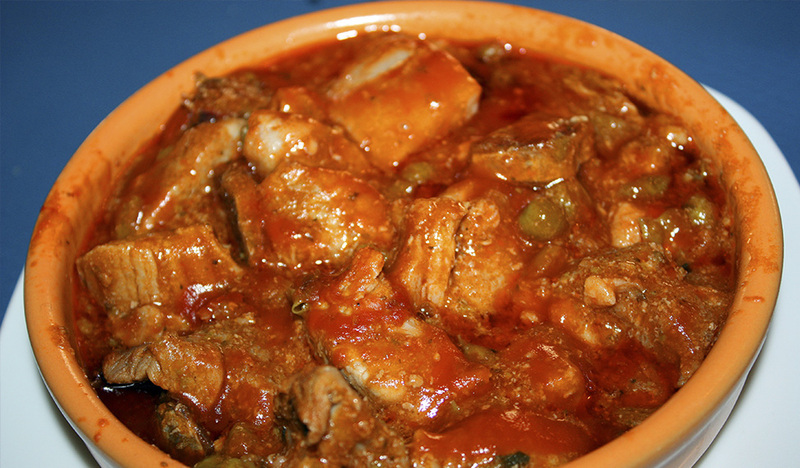 It is highly influenced by hunting and pig slaughter tradition and its dishes are meaty, blunt and simple to prepare, but very delicious: puchero, cocido, gachas, migas, pan, pote, and pisto are just some of its most famous ones, as well as stewed partridge and roasted pigeon. Do not forget to match them with the three most representative Designation of Origin wines in the region. For dessert, nothing better than marzipan! Toledo is the birthplace of this sweet made out of sugar and Marcona almonds that holds the Protected Geographical Indication designation. 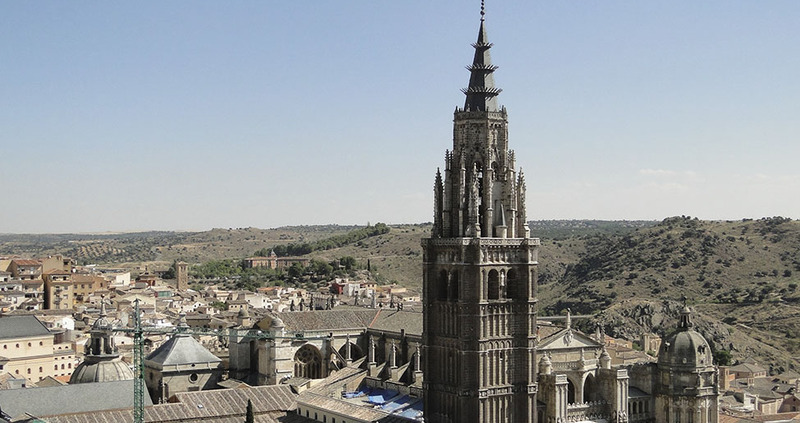 After tasting some of the jewels of Toledo’s cuisine, make a stop in your journey to visit the Prime Cathedral, a Gothic building surrounded by the Hombre de Palo and Comercio Streets, which will take you to the picturesque Square of Zocodover. This is where the Arab market stood and also where the famous production of steel swords took place. Nearby there are two other buildings that are also very representative of the old town: the fortress where Juan de Herrera worked and the Hospital de la Santa Cruz, a beautiful Renaissance complex. After admiring these architecture treasures, go down the Cuesta de las Armas, where you will be able to see the Gothic-Mudejar Puerta del Sol, the Gate of Valmardón, of Arab origin, and the Mosque of Cristo de la Luz. This intersection is the best example why Toledo is known as the “City of the Three Cultures.” You can’t leave the city without trying its famous Manchego cheese, made out of a native breed of sheep’s milk, and some of the popular convent sweets that are sold in every bakery in Toledo.